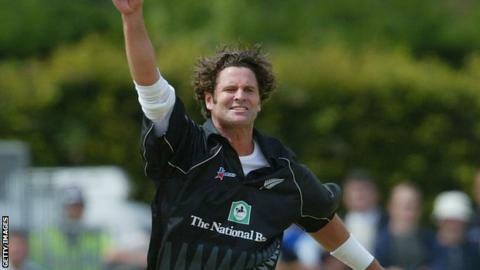 Chris Cairns says he has "nothing to hide"
Former New Zealand all-rounder Chris Cairns says he will fight to clear his name after news he is to be charged with perjury by the Metropolitan Police. The charge relates to a 2012 libel action in the High Court in London in which Cairns, 44, successfully sued Indian Premier League boss Lalit Modi. Cairns said he would do "whatever it takes... to again prove my innocence". He said in May claims he fixed matches were "absurd, bizarre and scary". A Crown Prosecution Service (CPS) statement said: "We can confirm that we have authorised police to charge Chris Cairns with one count of perjury, which arises from a libel trial held in the United Kingdom in March 2012." Cairns was awarded £90,000 in damages after allegations on Twitter that he was involved in match-fixing. He was interviewed by police in London earlier this year at his own request over the latest claims which he denied. The former Kiwi captain said in a statement on Friday that he had been notified by the CPS it was their intention to charge him with perjury on 25 September. "I'm obviously extremely disappointed. However, at least there will now be an opportunity to face my accusers in an open forum, with some rigour and proper process around that, so that I can clear my name once and for all," he added. "I hope that, through this forum, significant additional information will be flushed out that will help people to better assess the situation, as well as the character and motives of the parties involved. "I wish this wasn't the situation. Having been to court before, I know what lies ahead and how gruelling it will be and how tough it is on my family - but I have nothing to hide and I will do whatever it takes to once again prove my innocence." The CPS also revealed that Andrew Fitch-Holland, a London barrister who appeared as a witness for Cairns at the libel trial, is to face one charge of perverting the course of justice. "Both suspects will be formally charged by police in due course," added the statement. Cairns, an ex-Nottinghamshire player, son of former New Zealand all-rounder Lance, played 62 Tests and 215 one-day internationals between 1989 and 2006.